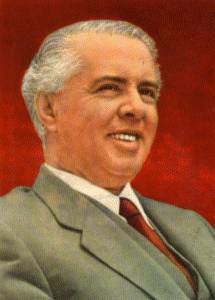 Enver HOXHA (b. Oct. 16, 1908, Gjirokast�r, Alb.--d. April 11, 1985, Tiran�), the first communist chief of state of Albania. As that country's ruler for 40 years after World War II, he forced its transformation from a semifeudal relic of the Ottoman Empire into an industrialized economy with the most tightly controlled society in Europe. Hoxha, the son of a Muslim cloth merchant, studied at the French lyce at Kor�� and reportedly also at the American Technical School in Tiran�. In 1930 he went on a state scholarship to the University of Montpellier, France, and then from 1934 to 1936 he was a secretary at the Albanian consulate general in Brussels and studied law at the university there. Returning to Albania in 1936, he became a teacher at his old school in Kor��. In 1939, when Italy invaded Albania, Hoxha was dismissed from his teaching post for refusing to join the newly formed Albanian Fascist Party, and he opened a retail tobacco store at Tiran�, which became headquarters for a communist cell. After Germany invaded Yugoslavia in 1941, Yugoslav communists helped Hoxha found the Albanian Communist Party (afterward called the Party of Labour). Hoxha became first secretary of the party's Central Committee and political commissar of the communist-dominated Army of National Liberation. He was prime minister of Albania from its liberation in 1944 until 1954, simultaneously holding the ministry of foreign affairs from 1946 to 1953. As first secretary of the Party of Labour's Central Committee, he retained effective control of the government until his death. Albania's economy was revolutionized under Hoxha's long rule. Farmland was confiscated from wealthy landowners and gathered into collective farms that eventually enabled Albania to become almost completely self-sufficient in food crops. Industry, which had previously been almost nonexistent, received huge amounts of investment, so that by the 1980s it had grown to contribute more than half of the gross national product. Electricity was brought to every rural district, epidemics of disease were stamped out, and illiteracy became a thing of the past. In order to enforce his radical program, however, Hoxha resorted to brutal Stalinist tactics. His government imprisoned, executed, or exiled thousands of landowners, rural clan leaders, Muslim and Christian clerics, peasants who resisted collectivization, and disloyal party officials. Private property was confiscated by the state; all churches, mosques, and other religious institutions were closed; and all cultural and intellectual endeavours were put at the service of socialism and the state. As ardent a nationalist as he was a communist, Hoxha excoriated any communist state that threatened his power or the sovereignty of Albania. In 1948 he broke relations with Yugoslavia and formed an alliance with the Soviet Union. After the death of the Soviet leader Joseph Stalin, for whom Hoxha held a lifelong admiration, his relations with Nikita Khrushchev deteriorated until Hoxha broke with him completely in 1961. He then forged close ties with China, breaking with that country in turn in 1978 after the death of Mao Zedong and China's rapprochement with the West. From then on, Hoxha spurned all the world's major powers, declaring that Albania would become a model socialist republic on its own. In order to ensure the succession of a younger generation of leaders, Hoxha in 1981 ordered the execution of several leading party and government officials. Thereafter he withdrew into semiretirement, turning over most state functions to Ramiz Alia, who succeeded him upon his death.